Drysol Dab-On Anti-Perspirant is extra strong to control excessive sweating of underarms, palms and soles. This is the only product that works for me. It does what it says. 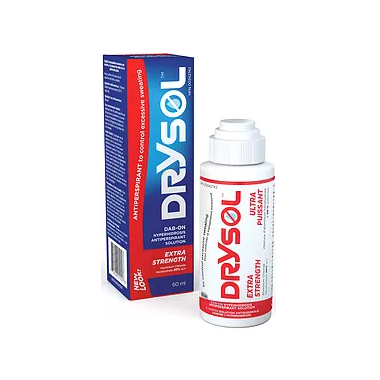 I read through every review before I bought drysol because I was unsure. Best decision I ever made to buy it. I've been using it for a few weeks now and I wish I had known about it when I was younger. I used it for 3 days in a row when I first got it and now I only need to use it once a week and there's no sweat. It's amazing. I'm able to wear anything I want now without the risk of sweating through. It does get itchy like everyone else said, but once you fall asleep it goes away. I barely feel the itch when I use it now. You don't need to use much either, a little bit goes a long way. Just ABSOLUTELY make sure you don't use it the day you shave your armpits because it would probably burn something awful. Also make sure your armpits are clean and dry before you do it as well and you're good to go! I used this product on my palms to treat excessive sweating. It dried out my hands...but they were still constantly sweaty! I could see how this product would would in areas like underarms - but for me, it caused excessive dry skin (was peeling) after only 3 nights of use! I wouldn't recommend for anyone with sweaty hands! I love the product but with there was a way to apply it as part of the kit. It is wonderful and works well with a small application. Very happy with the product. Works well. I have been using Drysol for a few years now and it works. I tried many other anti-persperants with no success. One application lasted 3-4 days. This product is life changing. I used to sweat whenever I was nervous or like others have mentioned, reaching out of the shower. This stopped all that. This product is beyond amazing. Works great and lasts a long time. After the first couple of uses, I now use it once a week or so and it lasts. This is my second bottle and I will continue to use it. Works perfect! I use it for my excessive forehead/anxiety sweating. Did not work after one night but after the second night it works perfect! I apply it once or twice a week. This product is magical, and I'm usually a skeptic. I even waited over a month of use before writing a review, just to allow time for negative effects to kick in. There have been none. I never ever want to go back to the frustrating and embarrassing excessively sweaty armpits I used to have every single day for decades ... especially now that I know how comfortable it is to have dry underarms and buy whatever shirts I want. Everything else I tried was a complete failure, and this worked immediately, the very first application for me. The second night application was unnecessary for my skin type. Since then I've been applying it less than weekly, also using occasional deodorant for smell. I like that I still mildly sweat when exercising or when its healthy to be sweating. I love that I no longer sweat profusely immediately after having a shower, or when I'm nervous. I will be a lifetime customer of Drysol, no question! The price is absolutely worth it. This works! Use it every other night for the first week and then every 3-4 nights. To avoid stinging do not use if you just shaved. This product doesn't have a scent which I love. For me it was a miracle product, suffered for years before I found out about it. If you don't mind spending a little money to solve a big problem then this is for you. Thankfully solved my problem and hopefully it does the same for you, good luck! Miracle in a bottle. Simple as that. Use it every two days for severe cases or at least in the beginning and after its alright for as much as once/twice a week! This product is the cat's meow. I have been looking for a product like this for the past 40 years. I used it as directed and have had dry underarms ever since. I am not only thrilled but still can't beleive my luck. I only need to use it once or twice a week now and am so happy with it that I have gone out and bought several new pieces of clothing in material that I never would have venture to buy before. Thank you thank you thank you!! This has saved so many shirts. I wish I had found it a long time ago. Do yourself a favour and check it out if you have any problem with underarm perspiration! Cant beleive how well this worked! For years I have been struggling with sweaty palms and as a salesman it can be pretty embarassing always meeting new people and always having to wipe your hand before you shake someone elses. Works extremely well and is incredibly affordable, great product! The only thing is I got a bit of a rash on the back of my hands, its not to noticeable but ive never had it before so im assuming it did come from the product. Never the less, like i said its not to noticeable so its no big deal at all. I will continue to use this product now that I know how well it works! I have been using this product for 2 weeks now and I LOVE IT!! I can't believe it actually works. I have spent a fortune in the past couple of years trying to find the perfect deodorant/antiperspirant and NOTHING has worked besides this. Even the clinical strength products at the pharmacy did not even come close. I only use it twice a week now. Make sure to use it at night as instructed. This product has worked extremely well for me! It stops embarassing sweating! I am so happy!!! I will be ordering it again when mine runs out! Thank you so much for offering a solution to my problem!! As advertised. Has definitely reduced the excessive sweating of my wife's palms. No skin irritation or other side effects noted. It really works but burns like crazy. LOL but I don't sweat so I am very pleased!!! I am usually very suspicious of any product making big promises. Have used Drysol for several months now and I have not had a sweat stain under my arms since. This stuff does work and I would recommend it to anyone. Life saver, works like it should and keeps me dry for 2-3 days! Amazing! I was incredibly skeptical when buying this product because i suffered from a very bad case of hyperhidrosis, particularly in the armpit area. I've tried nearly every "clinical strength" anti perspirant that you can get in the deodorant section to no avail. I tried this product on at night, and the following morning my excessive sweating stopped. Needless to say I was amazed. I still continue to apply once or twice a week (As per instructions). At its best it will stop your sweating completely, and at its worst it will significantly reduce (90-95%) the amount of sweat in an area. Could not be more happier with this product. If you suffer from embarrassing sweating, buy this product. It seems a bit pricey, but within one day of use you'll know it was worth it. I had been suffering from sweaty palms for over 25 years, and I was blessed with this product. I can now have a normal social life as this product stops the sweat by 95+%. I could not be Thankful enough! Great service from Well.ca as well as the product always ships fast. This product has been a life-changer. Absolutely amazing! Stung a little the first couple days, but doesn't hurt at all any more. No sweating under my arms AT ALL any more, even with a few days between applications. I had tried all the other "clinical" antiperspirants and none of them worked at all. Now I don't have to feel self-conscious about the dark circles under my arms any more! It works! Amazing stuff - used it as directed and I can now wear any kind of shirt without worrying about sweating. This product pretty much saved my life from embaressment from my over-excessive sweating in the under arms, worked the first time, no sweat stains, fast shipping, the amount is great for the price since you do not need to apply it on everyday, It lasts more than a week. I am so glad I finally got it, this product is amazing and I don't even need to feel self-concious anymore. This stuff is amazing!!! Ive been using for about 6 months now...and i only apply once a week now....its the only thing thats ever worked for me!!! Shipping is a amazingly quick..
Price is reasonable but luckily the little bottles run deep. May be itchy at times but wayyy worth it. My underarms are actually dry, first time since grade school!! Very effective product. It completely eliminated all sweat from my armpits. I was skeptical at first, but this product actually does prevent annoying underarm perspiration. I was a habitual sweater and I figured this might make me sweat less, but it actually STOPPED the sweating. I can't rave enough about the efficacy of this product. This is great. I can now hold my wife's hand after a romantic evening without grossing her out. I only apply once a week and now I can hold hands and wear flip flops, this summer will be awesome! I wish I had found out about this while I was still in high school, it would have saved me so much self-consciousness and insecurity! Works amazingly, after the first night of application my excessive underarm sweating was almost completely eliminated, and by the second night it was 100% gone. Now I only have to use it once or twice a week to maintain it, which is great since it makes the small-seeming bottle last for months. It does make my underarms itch/burn if I use it a couple nights in a row, but still, no big deal compared to the benefits! It is fantastic, I have had botox treatments but they only lasted 3months and costed thousands. I am very happy with this product. The only thing I must say is, do not put it on the day you shave. I shaved in the morning and put it on at night and that was a mistake (the product says don't put it on shaved skin but I thought since I shaved hours ago it would be fine but i was wrong). Otherwise I love it!! I am so happy with this product....it really works!!! I wish I new about Drysol in high school. I developed anxiety over the excessive sweating. Now I can be comfortable in social settings and have confidence when approached now. I will definately buy it again and will recommend it to anyone who has hyperhydrosis. I love it...i've tried everything, but nothing worked. It worked after the first usage. I can now relax around people without excessive sweating and feeling unsure. Thank you drysol. I used it only once 2 weeks ago and I dont't sweat anymore. My life had changed since that day! It works very well! However, it causes an itching sensation during the night after application. My only regret : I bought a 60 ml bottle and might not use it all! Works like magic. Used it last night and no sweat after the first day. Soooo happy. Shipping and processing was extremely fast. Thanks! been using this product for the last 10 years and the only one that works for my palm sweating. First off, I am a non-believer, I have a very healthy distrust in any product promising near-miracles. Well, I am happy to report that in the case of Drysol I was wrong. The product works as advertised. I apply it about twice/week to my underarms and have not had the tiniest spot of wetness since. Only "issue" I have is a sporadic itching sensation but that no surprise; the product description mentioned that. Therefore, easily 5 stars. This had been the only product to work for me! i bought this product for my son to try for his palmar hyperhidrosis, i was very satisfied with the fast delivery and will definitely be purchasing from this company again.